With school just mere weeks away, I have started to think about the impending doom of 530am mornings. Unlike the past few years, with my husband taking care of the mornings as he heads out to work, I’ll be jumping in since we will have not 1, but two, off to school. Phoenyx’s first year of Kindergarten starts next month and it’s a new chapter in all of our lives! I can’t tell you right now if I am happy or sad about it, a bit of both, so I am taking one day at a time. Now for the past 2 years of Phoenyx’s education, he has gone to preschool from 9-1. That means he isn’t used to getting up in the morning early, or having to get out of the door quickly, or the importance of eating a meal before he goes. Which is why, with the help of my partnership with GoGo squeeZ this year, I am helping other mothers like me come up with fun solutions to make breakfast, lunch, snack and sports time easier and more fun. To kick that off, I wanted to introduce you to GoGo squeeZ YogurtZ– a brand new real yogurt in strawberry, banana, and berry flavors that requires no refrigeration, making it an on the go snack or pick me up that parents and kids can both agree on. GoGo squeeZ YogurtZ pouches on their own are a great solution for busy mornings. Each scrumptious pouch delivers 4 grams of protein and 15 percent of the suggested daily value for Calcium and Vitamin D, making them an ideal part of breakfast. And since they don’t need a fridge, your kids can carry their YogurtZ pouches as is into the car or bus to enjoy as well! What I love about yogurt is that it’s so versatile. You can eat it on its own or pair it with granola, into a smoothie, popsicle, or even with fresh fruit to make deliciousness happen any time. 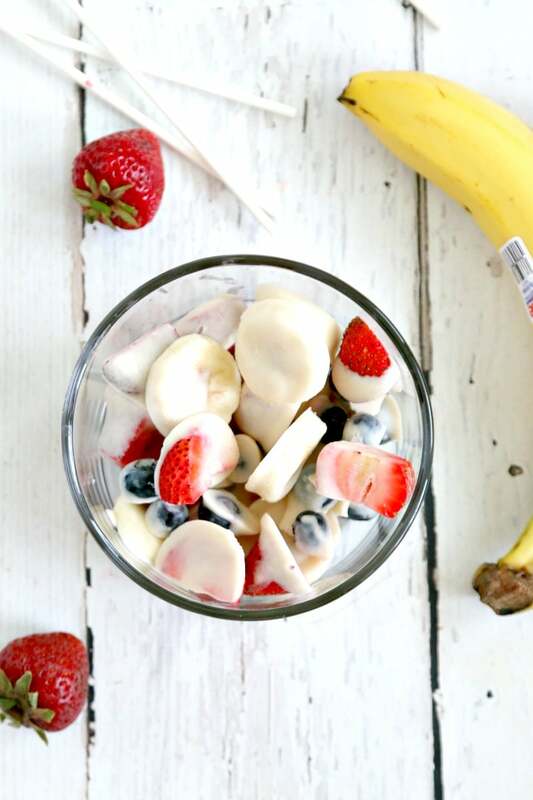 To help you bring some back to school fun to your breakfast table, I am sharing my tip for a quick and sound on the go breakfast: Frozen Yogurt Breakfast Fruit Bites. Squeeze your YogurtZ in a bowl. What we like to do is pair the Banana YogurtZ with fresh strawberries, Strawberry YogurtZ with sliced bananas, and Berry YogurtZ with Blueberries. Take a toothpick and dip your fruit into the YogurtZ bowl. Once all fruit is done, stick in freezer for approximately an hour for a solid freeze. When ready to serve, put in a disposable Tupperware container and enjoy! These need to be eaten immediately and if left out on the counter, will unthaw back to yogurt. Still delicious but slightly messier. Easy to pick up and eat. Hopefully, this idea will help bring a little bit of fun (and ease) to your morning! If this is your first time hearing about GoGo squeez Yogurtz, you can learn more here!